Gyeongju Guesthouse was quite easy to find since it's pretty close to the train station and a 20ish minute walk from the bus station. It's super close to downtown and the general tourist attractions so it was convenient. The rooms are clean and there are decent size lockers that are available. The place itself is huge and well maintained. Highly recommended! Great location and very friendly/helpful host. Close to many of the main attractions as well as bus to Bulguksa and the high speed train station. Would definitely recommend. Good location, all the buses to different sites leave across the street. Quite big for a hostel so not so much traveller atmosphere, but friendly staff. Kitchen is super good! Decent place. Location was convenient, close to the train station. It was pretty dead though when I was there (though admittely it was in low season). Staff doesn't really speak English, but was quite helpful in helping me arrange something for my trip (with the help of Google Translate :) ). Breakfast started at 6am which was great for our early morning start. Good location. Not far from cultural places and train station. Staff was helpful even though they could not really speak english. The room I was staying in needed a bit of renovation like the rest of the building. But good for price. Great spot. The rooms were a little small, but it was a solid place. BUT dorm and ensuite bathroom were visibly dirty and the bed wasn’t fresh because it smelled and it didn’t have covers that are easy to wash. The bathroom had stains on the toilet even though when I arrived, nobody was checked in that dorm, meaning it hadn’t been cleaned after the previous guest checked out. As the rooms don’t have keys I didn’t didn’t feel very safe The location of the hostel was very good and the owner was extremely helpful when it came to directions and recommendations. The place was okay, at best; price seems high. This hostel is a little outdated. The breakfast was DIY, which I'm fine with but it was pretty meagre, and the pans seemed over-used. Korean bathroom :-/ The dorm room I stayed in became incredibly hot, in Fall, so we turned on the AC unit, which my bed was directly under, as in, it was 1 foot above my head. Like AC? I got sick from not not sleeping all night and went home. 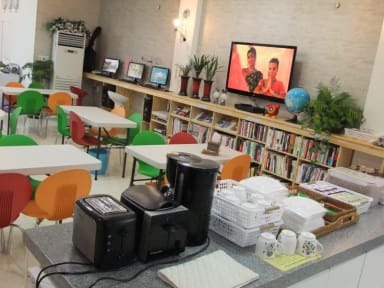 You can find better hostels to stay in for less, I think, even in Gyeongju.